In this week’s #QandAWed video we tackle a really valuable question, “how do I tighten my core, abs?” Since this is such an important topic, I wanted to go into more detail than we did in the video here with this post to explain a few key points further and to offer some specific workouts to try to further develop core strength. Your “core” muscles involve much more than just your abs – in fact, these spinal stabilizing muscles run from your shoulder blades, along your spine and back and include the four muscles of the abs (transverse abdominis, internal and external obliques, rectus abdominius) and the major muscles in the hip. it can be quite hard to engage the core when it is covered in fat tissue. This can really frustrate a lot people and consequentially put them off sticking to their fitness regime. A cosmetic surgeon like Sachin Shridharani MD might be able to help someone looking to overcome this predicament. How do I engage it? 1) Engage your abs from the inside out by drawing your belly button in to your spine (without holding your breath or ‘sucking in’ your stomach) and focus on holding the contraction of the abdominal muscles. 2) Press your shoulder blades down and away from your ears (this helps to ‘cap’ the contraction of the abs and engages the core muscles in your back). 3) Think of ‘lifting up’ through the pelvic floor to engage the muscles in the pelvic floor and deepen the contraction of your abdominal muscles. While not necessarily a defined part of your ‘core,’ contracting the pelvic floor muscles can help you maximize your abdominal contraction, and may additionally build strength in the pelvic floor at the same time. You may have heard advice to relax the abdominals during pelvic floor work (especially during exercises to help reduce urinary incontinence). Just like anything, this may work for some and may not be the best for others. As I mentioned, if you are doing these exercise to help reduce urinary incontinence and you are getting positive results from it, keep it up! But if you are not having any luck, you could look into a specialist like Advanced Urology to find a faster solution to this problem. The earlier you get it sorted, the more comfortable you will become in doing everyday tasks and exercises. 4) Test it out – standing with feet hip width and knees slightly bent, imagine standing on a unstable surface (like a rocky ship or subway train) and shift your weight quickly from one foot to the other, maintaining all of the contractions listed above (you can even place your hands on the sides of your waist to feel these muscles contracting). Think of a strong core as your body’s support system – these muscles help you stand taller, move more smoothly, and potentially even lift more weight safely. By stabilizing your spine, your core muscles provide you with a strong, stable foundation for everyday activities like lifting heavy objects (like your toddler) and assist with movements that require balance and coordination (like jumping over that puddle at the last minute). A strong core may also help boost your workout performance too, which could translate into both a better fitness level and faster results. One 2009 study done by researchers at Barry University found that 6 weeks of core training drills helped improve the performance of recreational and competitive runners. 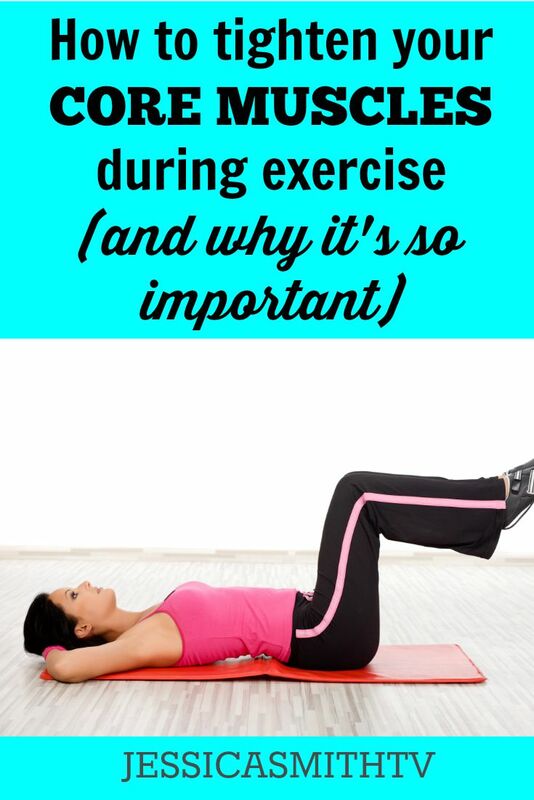 What are some of the best ways to strengthen your core? Targeted abs workouts can be great for engaging and strengthening the core, but don’t forget that you can also get build core strength from focusing on it during your total body workouts as well. Aim for a mix of training that works your core in a multitude of ways, including exercises that involve challenging the core muscles to do what they are designed for — stabilize your spine. While most of our workouts here on JESSICASMITHTV involve engaging the core in some way, here are a few routines to try that really zero in on core strength. For more options, check out our full playlist of abs videos here. For more options, check out our full total body training playlist here. Tell me, what workouts or exercises have helped you the most when it comes to building core strength? Share with us in the comments below! I go through the same thing. I just can’t do it, either. I can’t tighten my core and ab muscles without holding my breath, everytime I try to breath while having my muscles tightened it gets loose and just can’t keep it up. please help, I really don’t know how to dot this. Okay, so you say to “draw the belly button towards the spine without holding your breath or sucking in your stomach,” which is what my aerobics teacher also says and this doesn’t make sense. How do you do that? How /can/ you do that without sucking in or holding your breath? That’s the only way I know how to do that! This is really helpful and so perfect! Just the exercise I was looking for. Cheers to you! and keep up the great work! I have a lot of weight on my tummy and all the exercising does not seem to help. i have been exercising consistently over 3 months now – first with yoga and then I found your website. I started with the fit-in-15 which was completed 2 weeks ago and now I do other exercises from your channell – core, cardio. But my belly is still there. Help! Would these be some of the videos you would suggest for diastasis recti? How can I buy the New Healthier You Fitness Plan I have on myfitnesspal? Excellent information! A great reminder to no forgets that your core is much more than a six-pack. Thank you for be such an inspiration! Hi Linda! Thanks to YOU for being a part of our community here! We’re so glad you are joining us for this and know that we are here with you and we’re only a click away! Love your spirit and focus – keep up the great work you are doing taking care of your body and your health and keep focusing on the positive energy and people you want to attract into your life. They are on the way 🙂 We’ll see you soon for our next session together! I have Degenerative Joint Disease in my spine and my doctor’s (and physical therapist) have determined and shown me how I have been using my core muscles incorrectly while exercising for the past 15+ years! Your tips above are crucial for everyone engaging in physical activity. Just because I have a relatively small waist, I thought my core was strong. WRONG! Thank you Jessica for such important information! One thing I try to always keep in mind is a tip of a friend (worth it ?) = we mustn’t have a blocked diaphragm to allow muscles of abs working well. In fact we must be rather relax and just think to breath !